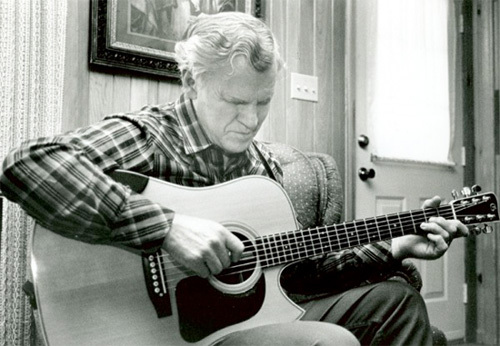 Doc Watson, the legendary Grammy-winning flatpicker from western North Carolina, died Tuesday in Winston-Salem, his manager said. He was 89. Watson, who was blind for nearly all of his life, had recently undergone hospitalization for abdominal surgery. Watson had performed last month in Wilkesboro, North Carolina, at MerleFest, an annual bluegrass and old-time music festival named after his late son. “His impact on music and culture will be felt across the globe for generations,” a MerleFest spokesperson said. Skip Matheny of the band Roman Candle interviewed Watson recently. The interview was originally published last month on American Songwriter.com. Doc who are some of the lyricist you admire? Songwriters that write good words, maybe now or over the years? I know you like Jimmie Rodgers. Jimmie Rodgers was the first man that I started to claim as my favorite. And Riley Puckett wrote some fun songs that I liked. He used to sing, I don’t know if he wrote it or not, “Old Dan Tucker.” I liked that song [laughs]. And then there was Hank Williams. I know you like Kris Kristofferson’s words. Oh, yes, I certainly do. And the fella who wrote “Any Time” for Eddie Arnold, that’s a fine song. I know that you preserved some songs by arranging and recording them over the years that may have otherwise died out. What are some of these songs? Something like ‘Little Sadie.’ I think you are one of the few people that played that song. “Talk about Suffering” is certainly one that is identified with you . I first heard my mother sing “Talk About Suffering” when she was hanging out clothes when I was a little bitty boy. Click here to continue reading the interview.